Chris de Burgh was, all things considered, rather proud of his back catalogue. He'd had some big hits in his day, but the one song he slightly regretted writing was that ever popular classic, Lady In Red. It wasn't the song itself that was the problem, but the fact that the mischievous imps he called his friends never failed to send him a pic of a lady in - you guessed it - red whenever they came across one. The little blighters had totally blown his data limit for the month by sending him an assortment of pics from some seamstress in Melbourne who had donned a red dress for an event called Frocktails. Chris sighed as another pic notification dinged on his phone. Who were these people, he thought jadedly to himself, and what the hell is a Frocktails when it's at home? He stopped to look at the pic, and despite his general weariness of all girls in red dresses, he couldn't help but think that this red dress wasn't actually bad as far as red dresses went. Tossing the phone onto the sofa, he then sat down at his piano to finish composing his next hit. He had been inclined to call this one Lady In Absolutely Nothing, but remembering the pictures filling his phone he thought better of it. and called it The Great Non-being instead. Oh dear - my apologies to Chris de Burgh, but ever since that night I have had Lady In Red on constant repeat in my brain. Wearing a red dress to Frocktails will do that to a girl! 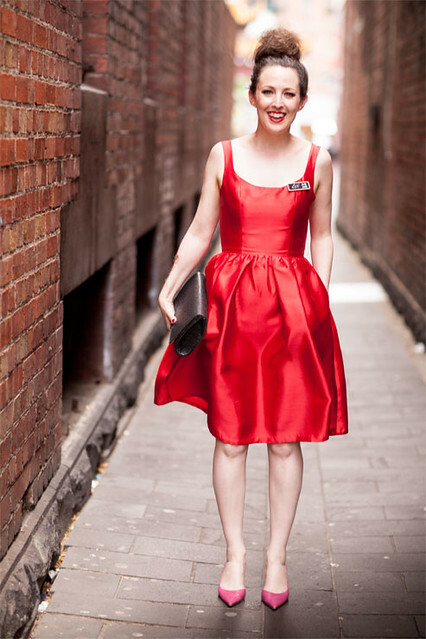 Melbourne Frocktails 2016 was a blast, and it was such a pleasure to see so many other fellow seamstresses all in their best, most inspiring finery. Old friends were caught up with, and new ones were made - it was a wonderful, wonderful night! I had already made a version of Vogue 9100 the week before (as yet unblogged), and was so darn pleased with how it turned out that I immediately began dreaming of another one. 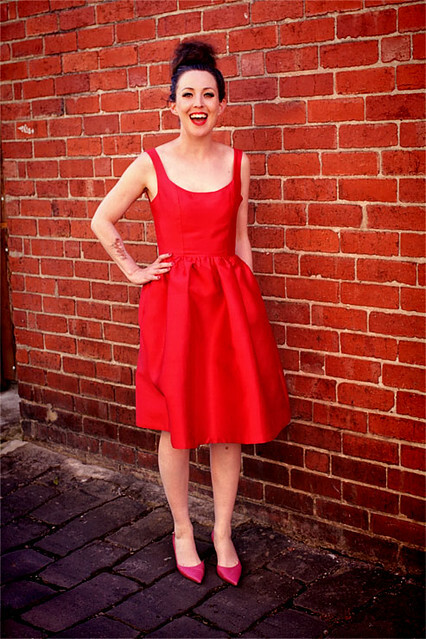 The first one I made was in cotton, but with the tight bodice and full gathered skirt, I knew that the next one should be made into something sumptuous that with a skirt so full it could fill a room! Dashing into The Fabric Store with a scant 20 minutes to spare before they closed for the day, I caught sight of some red silk dupion, and knew my choice had been made. If I may say so myself, the gorgeous lustre and the full body of the dupion made this dress! Sometimes the pattern itself that you use isn't overly complicated, but when pared with the right fabric it can become something very special indeed, and I humbly think I may have achieved that with this frock! The pattern is one of those marvelous Custom Fit ones, where you can get a very accurate fit on the bust, which was brilliant because it made me look like I had actual cleavage, for once in my skinny minnie life! 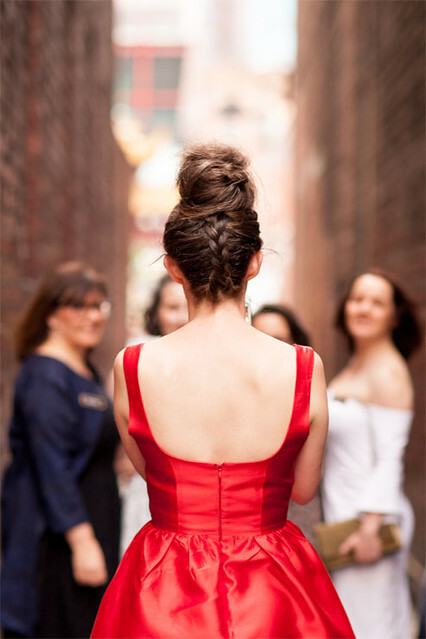 The super fitted bodice (I did wear a strapless bra, but I could totally have gotten away without one, so tight was the fit) combined with the fullness of the skirt meant that my waist looked pretty small. Ah, love a bit of trompe l'oeil! The only issue I had with this pattern was the fact that I was unlucky enough to purchase one of the versions with the skirt pattern pieces printed wrong. Thankfully I had already read about this on Pattern Review, so was able to redraft the pieces before I cut out my fabric. I was told by Clegs, where I purchased the pattern, that if I cared to bring it back to the store they would happily replace it for me. All in all, I am thrilled with this dress. It had everything I love in a frock - full skirt for swishing about it, pockets, great fit and the shine on the dupion makes me feel very regal indeed. 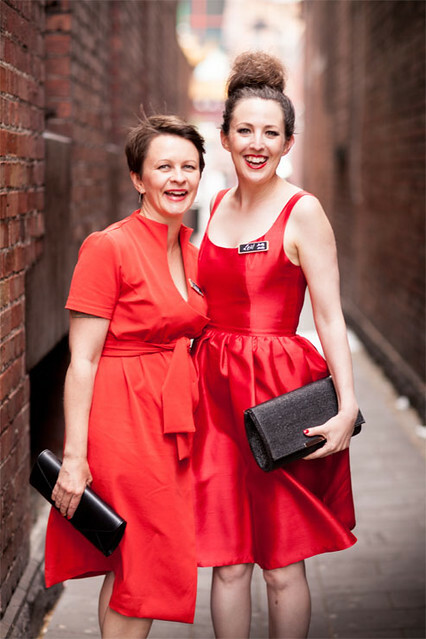 It was perfect for a night of dressing up (thank you ladies, for organising Frocktails!) and I'd also like to say a big thank you to photographer Kirsten Simpson for her amazing pics of my dress (and everybody else's!) on the night. Her work is all the pics on this post, except for the very top one. What a talent! And last but not least, here is my other favourite lady in red - or orange to be absolutely correct! I loved this dress so much! How did you finish it? What fabric did you use? I almost always fully line the bodice with cotton lawn but I'm wondering lately if I should try something new. I'd love to do a faced lining, but can't find a good tutorial anywhere. I fully lined the bodice with the silk dupion for extra strength. Nothing else - no boning or interfacing required. The skirt is unlined, but all seams and hems were handfinished for a super neat inside job! lovely, thanks! Culottes are a great way to pretend you're not wearing pants. 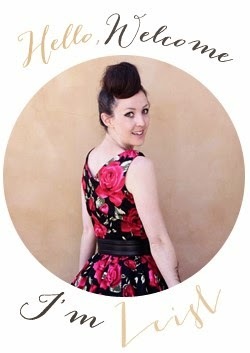 This is one of the most beautiful dress I have ever seen in sewing blogosphere :) You look lovely! Gorgeous dress and so happy wearing it. Naw! �� We certainly stood out! Oh I almost had to look away when Chris De Burgh imagined a naked lady and then "tossed..." :) relieved to read it was only his phone! I hope you twirled the bloke around the kitchen in a dance when you got home. You looked fantastic and I'm always amazed when you reveal the secret of all that, smooth structured bodice is... nothing. This dress is gorgeous! Can I ask if you followed the pattern instructions to construct the bodice (ie. slipstitch the shoulders?) Or did you see the shoulders by machine and turn the whole bodice through the straps? I have this in my stash and I'm trying to work out the best way to go about it. I prefer the machine method but I don't know if the straps might be too narrow? Anyway, I love your version, so beautiful! I followed this pattern exactly as the instructions said - it's a method I've done before, and if you press very carefully then the slip stitching should be invisible. Plus I didn't want to crease up my fabric by pulling it out through the straps! Thanks so much! I'll stick with the instructions then :) I think turning those straps might be tricky!